D/Earth is a low cost nontoxic safe mineral made of crushed fossils. Pure Diatomaceous Earth can be used during the parasite season both internally and externally to improve health appearance and wellbeing of animals. 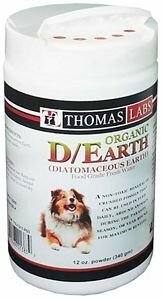 Diatomaceous Earth is a product that can be used as a nutritional supplement for a wide variety of conditions. Contains the highest concentration of pure raw Diatomaceous Earth available.